See me speaking about the history of landscape painting in North Norfolk in the new film Cley Marshes: A Wild Vision, produced by David North for the Norfolk Wildlife Trust’s Cley Marshes Appeal. 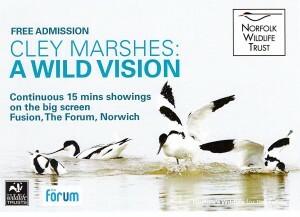 If you are visiting Norwich in September, do pop in to the Forum to see this inspiring film featuring Bill Oddie, wildlife experts, artists and others sharing their stories of this special place. The NWT is the oldest of a national network of wildlife trusts. The 400 acres of Cley Marshes were purchased by Dr Sydney Long in 1926. Long went on to found the Norfolk Wildlife Trust with Cley becoming the Trust’s first nature reserve. For generations this site has enjoyed a worldwide reputation as a superb site for watching birds and experiencing nature. The appeal is raising funds to purchase an additional 143 acres – this is a unique opportunity to ensure that coastal land from Blakeney Point to Kelling would all become one continuous nature reserve. Find out more about my landscape art project, Spirit of Place. This entry was posted in current projects, Spirit of Place and tagged Cley Marshes, Norfolk Wildlife Trust. Bookmark the permalink.